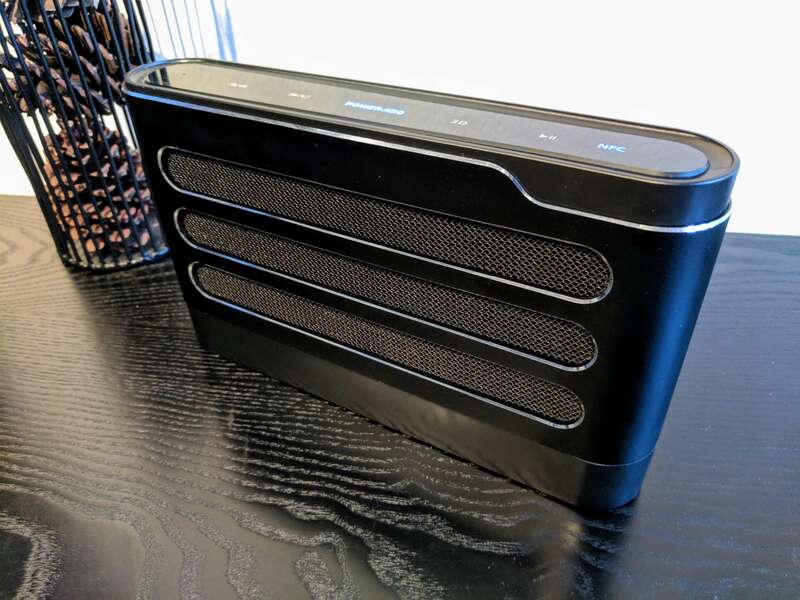 The Poweradd Soundfly is an excellent Bluetooth speaker option that I have no problem recommending. The quality of the construction is excellent while the audio quality is equally as impressive. Connectivity is made very easy thanks to the NFC functionality built into the speaker so you can get to playing your beats quickly and hassle-free. Physically the Soundfly measures 10 x 1.8 x 5.8 inches in size and weighs 2.62 lbs. In new money, that is 254 x 46 x 148 mm and a weight of 1.19kg. Internally it has four 10W speakers that measure 1.7″ in size (45mm) with a radiator for deep bass sound. The speaker array is coupled with a DSP Processor to enhance the audio experience. It creates an excellent stereo sound with good tonal quality across the entire range of audio. Internally there is a 4000mAh battery that can be recharged in about 2.5 hours and offers 4-8 hours of playback time depending on the volume settings. The louder the music, the less battery life you will get. You can, of course, leave the Soundfly connected to AC if it is going to be stationary in your home or office. Connectivity to the speaker is done via Bluetooth 4.0 or via NFC. With it being 4.0 technology built in, you have a 30′ (10 meters) radius from the Soundfly in which you can see and connect to the speaker to your phone. 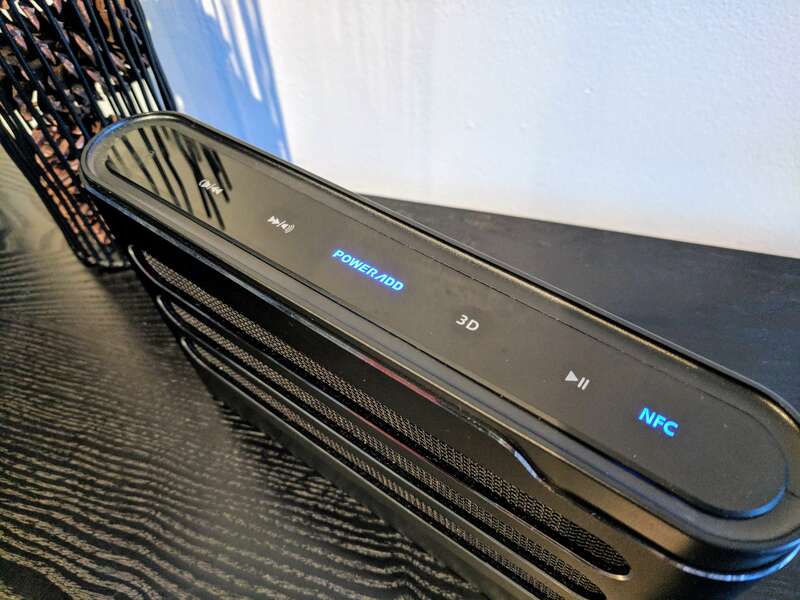 Alternatively, if you have a phone with NFC (if you are using Android Pay or Apple Pay, you do), then you can hold your phone near the NFC label on the top of the speaker and it will automatically connect up for you. Controls for the volume, power and play/pause are located at the top of the speaker. They are backlit and touch sensitive. There are no physical buttons on the Soundfly. Finally, there is a built-in microphone to allow the Soundfly to be a speaker phone for you once you have connected your phone to it. The chassis of the Poweradd Soundfly is made of combination of ABS (Acrylonitrile Butadiene Styrene) plastic and aluminum. The plastic is black with the aluminum trim shining through, giving it an elegant look. 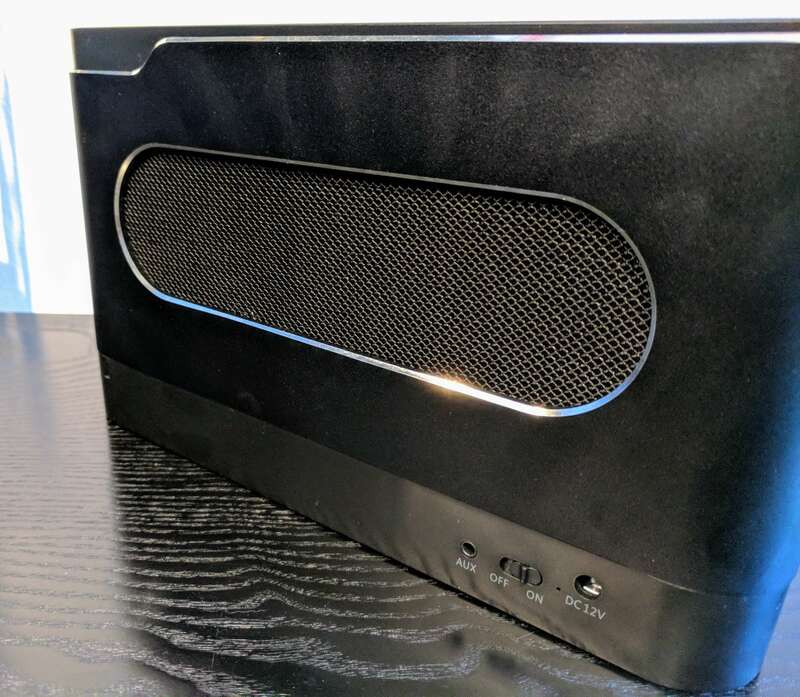 The sides of the speaker are rounded so it doesn’t have a square look to it. On the front you will find three speaker grills where the four 10W speakers are located. One the back there is a single grill where the bass radiator is located. The top of the Soundfly, as mentioned, is where you will find all of the controls for the speaker. These are backlit in blue making it easy to see them in a dark room. The “Poweradd” logo always remains lit and, if you are connected via NFC, it will too. Meanwhile, the bottom of the speaker has a non-skid silicone ring to keep it from sliding around on a smooth surface. 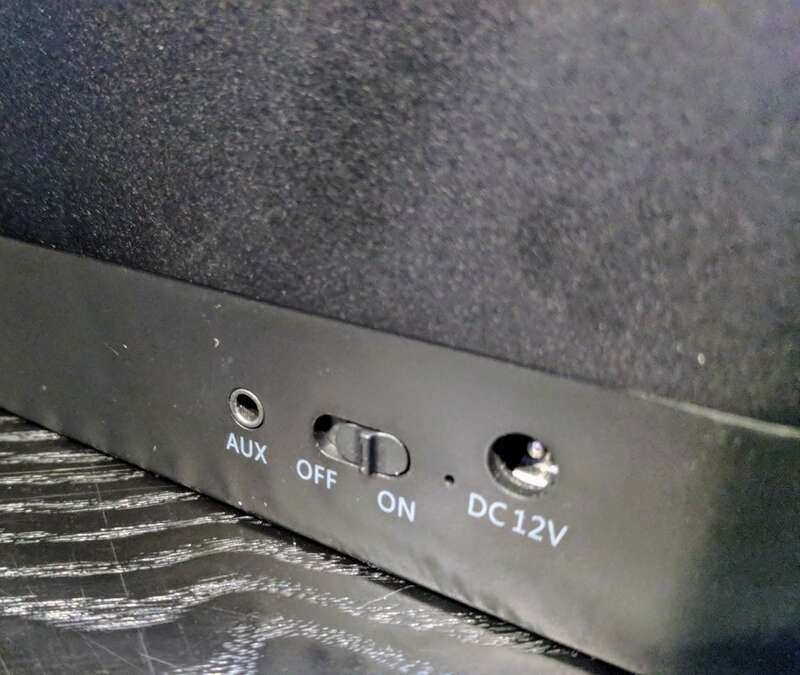 On the back, below where the bass radiator is located, is where you will find the main power switch for the speaker as well as the 3.5mm AUX port and the 12V DC input port to charge the device. When it comes to using the Poweradd Soundfly with your phone, there are three ways to connect it up, two of which depend upon Bluetooth. First, there is the traditional way of opening up the Bluetooth settings on your phone and search for the speaker in the list of available devices. Once you do that, you will get an audible tone to let you know that you are connected. Second is NFC. This connect your phone via Bluetooth as well but without having to actually search for the device. Simply turn the Soundfly on and hold your phone over the NFC logo at the top of the speaker. You will get a notification asking if you want to connect to the speaker. Tapping yes will have the speaker and your phone sort out the Bluetooth connection automatically. It’s pretty obvious but you do have to have a phone that supports NFC. Third is the 3.5mm auxiliary port. This port is aimed to be use with older devices such as an MP3 player but you can connect your phone via its headphone jack to this port with the provided cable. The touch controls at the top of the speaker allow you to forward or repeat a track while holding them down will allow you to adjust the volume up or down. There is also a Play/Pause button that you can use. Like other Bluetooth speakers, you can control all of this from your phone as well using the volume buttons on your phone and the Play/Pause feature in your favorite music app. The 3D button allows you to enable or disable the DSP Processors as the Soundfly plays music. Generally you will want to leave this on all the time but you can turn it on or off to see the impact it makes to the audio quality of the music. The Soundfly has excellent sound quality both at low and high volume. Music is distortion free at higher volumes regardless of the genre of music being played. In my testing for this review, I listened to music from Andrea Bocelli, Rammstein, Marc Antone and Lady Gaga covering a wide range of high and low tones genre. All of them were excellent. For some readers, they may find that there is more bass than they desire but if you like having a lot of bass in your music, this speaker is one to consider. Bass is excellent, crisp and clear with a heavy bump depending on the type of music you are listening to at the time. The Soundfly is currently available on Amazon for $79.99.